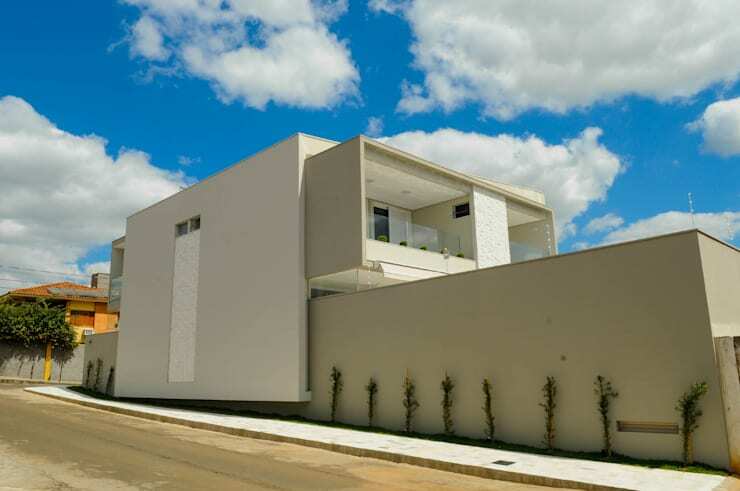 This beautiful design, brought to us by Brazil's, A/Zero Arquitetura, showcases an impressive, modern home, filled with light and air, but also framed by high walls for a sense of privacy. The exterior of the home presents a luxurious compound, constructed of grey concrete and emanating a cubist aesthetic. Once inside we're met by an open, expansive and light-filled premises, predominantly decorated with white decor to enhance its spacious and airy atmosphere, and housing an array of luxurious yet understated furnishings. 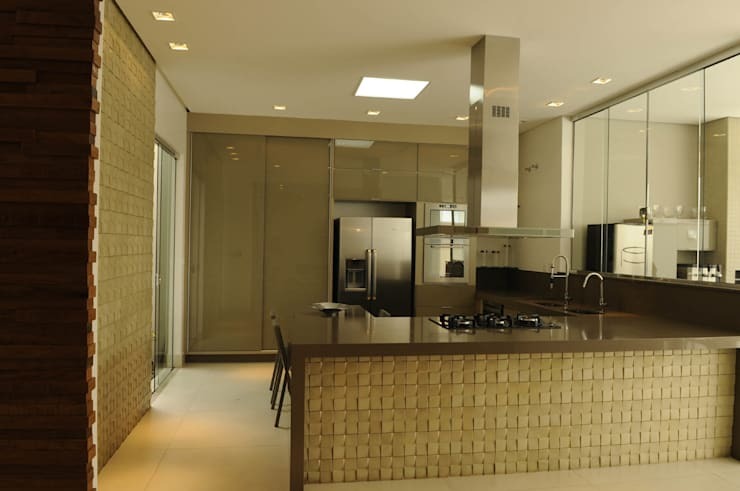 Multiple tones and textures have been interspersed throughout the home's white walls and ceilings, such as a feature wall of compacted, wooden panels and an array of beige tiles that create a 3D pattern across the kitchen bench. 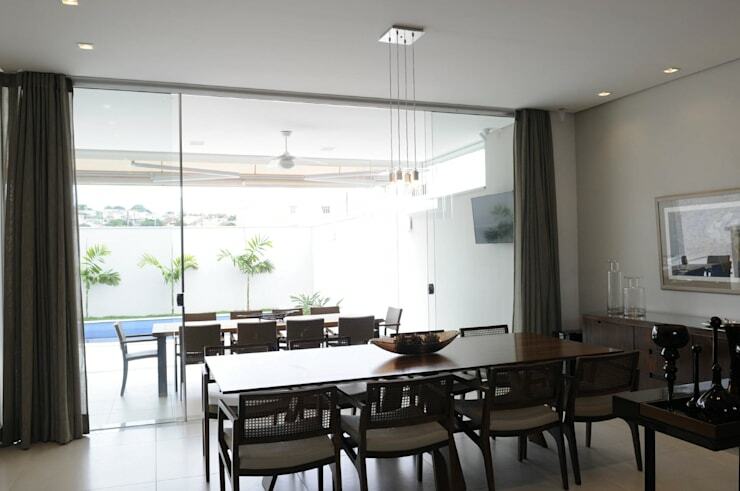 Perhaps most impressive in this design however, is the ease with which this home can open out onto its stunning courtyard, amalgamating indoor and outdoor living areas and taking full advantage of the warm, Brazilian climate. The courtyard not only houses an lengthy dining setting and enviable outdoor kitchen, but also a pristine swimming pool, which invites relaxation and refreshment with its deep blue tones. From the outside this home presents a flowing, cubist construction in a subdued palette of pale greys and white. The home stretches up over two stories, and is surrounded by high walls that lend privacy to its spacious interior and enviable courtyard. Panels of textured, white tiles decorate the facade, while ample sunshine flows in through a series of windows and glass balustrades, ensuring that this lovely abode is well lit whenever the weather allows. Moving inside and we're embraced by a stylishly furnished living room, with a contemporary feel. Crisp, white walls, floors and ceilings frame a space populated with luxurious, modern pieces, from the streamlined, grey sofa seen here, to the accompanying, black coffee table and glass shelves lining the TV unit. Wooden panels in a deep tone add classic appeal to the space, with timber constructing the TV unit and also lining the contemporary armchair seen in the distance. 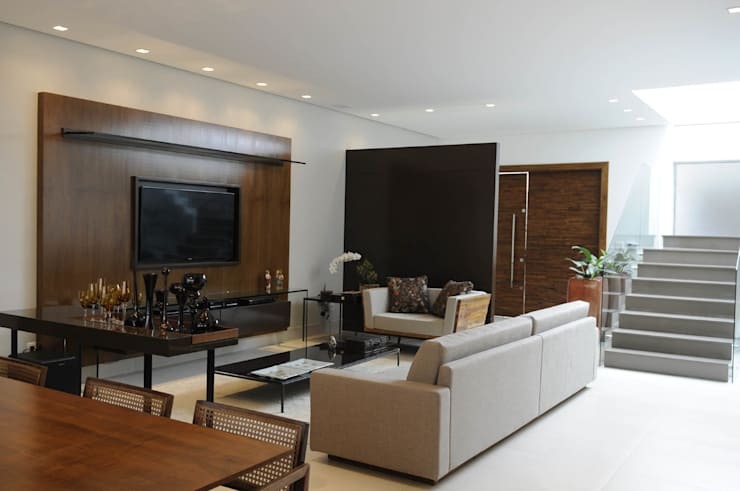 An alternate view of the living room reveals the open plan design of the home's interior, with its stylish decoration also flowing through to a dining room and kitchen, while a sitting room has been included, tucked beneath the stairwell. 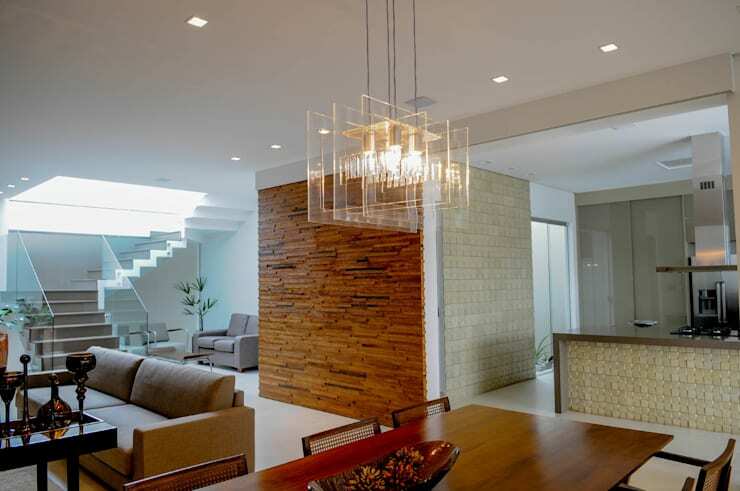 Contemporary style defines this home, seen here in the cubist, perspex light fitting dangling over the dining table, and the feature wall of compacted wooden panels separating the kitchen from the remainder of the space. The home's kitchen also exudes plenty of modern appeal, with its sleek finishes gleaming beneath an array of spotlighting and a small skylight. Flowing benches of brown stone have been paired with the glossy sheen of stainless steel, while an array of storage in a lighter brown populates the kitchen's far wall. Perhaps most intriguing within this space are the beige tiles lining the kitchen bench and left hand wall, which create a 3D pattern to contrast against the room's sleek surfaces. The kitchen is also beautifully lit, with a small door on the left hand side leading to the home's front yard, and windows lining the kitchen bench providing a view of the back yard. Across from the kitchen sits a lovely dining setting, which is bathed in sunlight flowing in through the home's expansive, floor-to-ceiling windows and glass doors. A lengthy table in dark wood provides ample room for communal dining, with the simple design of its surrounding chairs and credenza carrying through the home's air of understated sophistication. Beyond the glass doors we can see a second dining setting in similar style, this one waiting to accommodate outdoor culinary adventures in the home's gorgeous courtyard. Let's take a closer look. The courtyard presents a stunning addition to this beautiful home through its understated decor of pale grey, cool white and warm timber finishes. An outdoor kitchen with fridge, bar and oven waits to accommodate a lively pool party, while a lengthy dining table lays the foundation for a hearty meal. 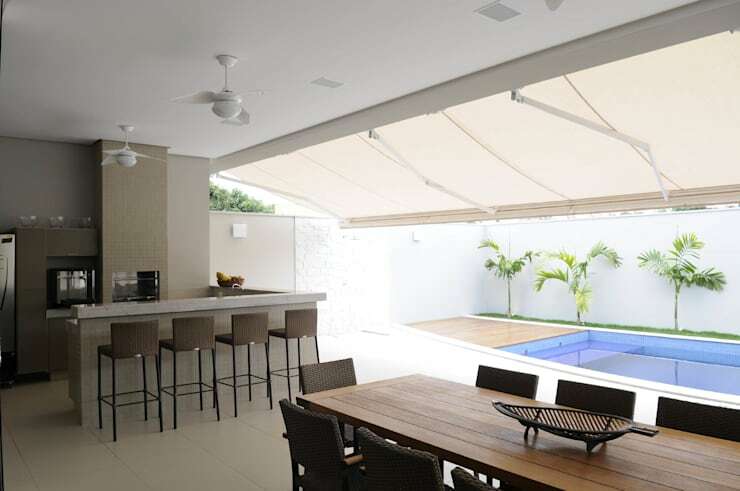 Retractable awnings are on hand to shield the space from the heat of the summer sun, while in the distance we can see the deep blue of a small swimming pool, which beckons with the prospect of a refreshing dip. 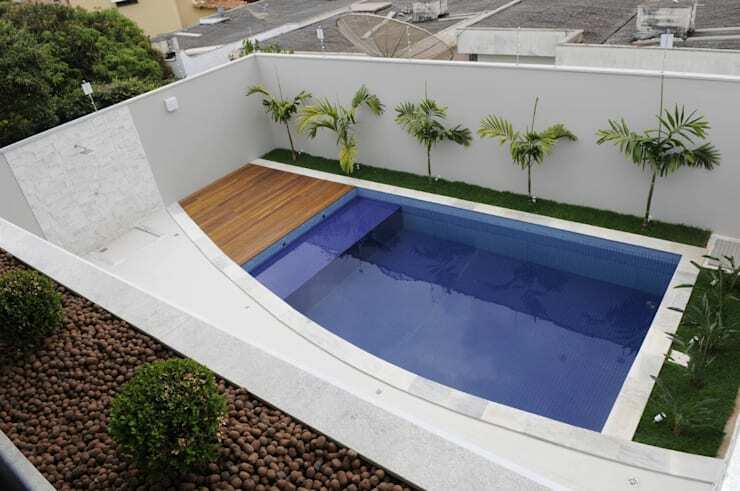 An aerial view of the courtyard displays the pool in its true glory, with its deep blue providing a lovely contrast against its the caramel tone of its wooden decking and the green of the small garden lining the space. High walls frame the space for privacy, with their white finish flowing down into the courtyard pavement. On the left hand side we see a section of compacted stone in the same style as that decorating the home's facade. This delineates an outdoor shower, adding another element of refreshing luxury to this sublime setting. Did you enjoy the open and light feel of this amazing, contemporary home? If so, take a tour of A Fabulous Family Home in Spain for more ideas and inspiration! What do you think of the courtyard in this lovely home? Would you like something similar at your premises? Tell us below!